In 2012, the United States Department of Agriculture began to raise nutrition standards for foods served in schools, causing consumer advocates and nutritionists to believe that fast foods would disappear from school lunch lines. This did hold true for many commercialized products, as most fast foods did not meet these new “healthy” standards. However, some food giants like Dominos began to use these new rules to their advantage, changing their already existing products to fit in with the reformed school nutrition guidelines. Sensing that this change would come, Dominos quickly looked toward its research and development team in developing a new type of pizza eating experience, designed specifically for school-aged children. In 2010, Dominos introduced the “Smart Slice,” which has 1/3 less fat, 1/3 less salt in the sauce, and 1/2 of the fat in the cheese. It also uses 51% whole-wheat grains as opposed to exclusive white grains that have more sugar. In 2010, the “Smart Slice” was being delivered to school cafeterias across three states. Now, this has expanded to over 3,000 lunchrooms in 38 states. I think it’s about time for some critical Domino’s-inspired analysis. First, let’s look at the actual extent to which Domino’s has made a drastic nutritional change to their pizza. If we look at the nutrition information on the Domino’s website, it does not specify the calories for one slice of pizza. Instead, let’s look at the smallest pizza size, the 10”, which is designed for individual consumption. Domino’s reports that for a small, 10” thin crust pizza the serving size is 1/4. That is much smaller than one regular slice of pizza. I speak from collegiate experience when I say that most people consume the entire 10” pizza, which is 880 calories – a calculation that Domino’s does not give on their website. And that’s just the thin crust! If we switch this calculation for “hand tossed” crust, which is what Domino’s is known for, the serving size magically changes to 1/6 of a 10” pizza at 200 calories. This means that this individual pizza would cost you 1,200 calories of the average 2,000-calorie a day intake. The calorie count for the “Smart Slice” is most likely slightly lower than these calculations, although I cannot be sure because the nutritional information about this specialty is no where on their main consumer website. 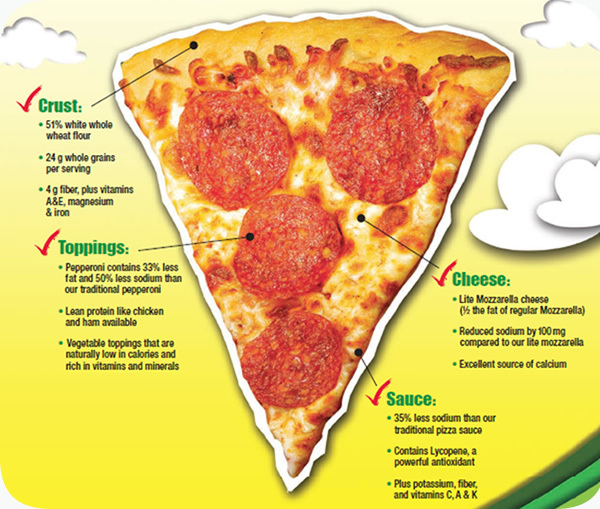 There is simply a beautiful picture of the “Anatomy of a Domino’s Smart Slice,” but nothing about overall nutritional content. And if that wasn’t enough of an “ew” moment for you, we haven’t even gotten to the discussion about the effects of this commercial material on children’s minds! Dominos delivers these pizzas directly to schools, and “its trucks, employees, insulated boxes and lunch-line placards help imprint the company’s red-and-blue logo on the brains of students.” Students are becoming “brand brainwashed” in schools, and nutrition and consumerist experts warn that this will drive more students to head to Domino’s after school hours. Not only is Domino’s able to develop a loyal following of young eaters, but the “Smart Slice” creates a false sense of reality that Domino’s pizza, or pizza in general for that matter, is healthy. Here’s the kicker: the “Smart Slice” is not available at any local Domino’s locations and the company has no plans to sell this type of pizza in their actual stores. So their increased adverting in schools may claim to be aimed at this “revolutionary” pizza slice, but I (and I hope most consumers) can see right through this type of immoral advertising. Domino’s is not alone in this endeavor, and this is not a new phenomenon. For years, commercial companies have been promoting school-related projects, textbooks, lunches, posters, and more in the hopes of advertising to young children. It seems genius for these companies: reach a large number of young people who are likely to buy a certain product, and target them where they spend the most time exercising their brains. If students are learning important material while sifting through corporate logos and slogans, the advertising strategy is likely to work. A Domino’s spokesman was quoted by the New York Times, stating, “Some schools like the branding because brands drive sales…”. Shouldn’t we be more concerned with this type of marketing tactic’s affect on students? Shouldn’t schools realize that equating one of the unhealthiest food chains with health is not such a good idea? I think it is time for a cold, hard look at these corporate sponsorships and their impact on the youth of America. ← Who Doesn’t Want Permanent Employment?